"All of [Hank's] tunes flow so freely, you can really swing with them. I mean really swing!" The train ride from Newark to New York City is about 25 minutes, but in the jazz world, it can take years. 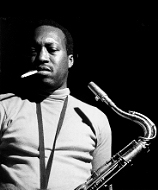 Hank Mobley make it at the legal age of manhood, 21 years old, when Max Roach guested with Paul Gayten's Newark band, which featured Hank. Roach hired him immediately. After Max Roach, the tenor saxophonist worked with Tadd Dameron and Dizzy Gillespie among others before joining the Horace Silver Quartet at Minton's in mid 1954. When Alfred Lion of Blue Note approached Horace Silver about doing some more recording, but with horns instead of trio, he selected Mobley and bassist Doug Watkins from his quartet and Art Blakey and Kenny Dorham, with whom he had worked requently around the city in those years. Their mutual ideas about music and love of playing together prompted the five men to begin gigging and recording as The Jazz Messengers. As such, they would become the fountainheads of an earthy new phase of jazz that is usually termed hard bop. The jazz public and the critics' fraternity tended to overlook Mobley, thinking him an unlikely candidate to carry that particular jazz message. For one thing, he had a soft tone, which was out of fashion in a world dominated by the tones of Coltrane and Rollins. His rhythmically subtle and intricate patterns of improvisation required concentration to appreciate. Mobley is a brilliant and absorbing player; whatever effort in might take to get to that is rewarding and worthwhile. By mid 1956, the Jazz Messengers disbanded, but they had all made names for themselves through their mutual association. The 12-inch LP was blossoming, thus jazz recording was at one of its busiest levels. Mobley made dates of his own for Savoy and Prestige and made the rounds as a sideman on countless sessions, the majority of them on Blue Note. In November, he would record again as a leader for Blue Note and play on Silver's first album since the breakup of the Messengers. "Senor Blues" was on that album and set off Horace Silver's career as a bandleader. Mobley would stay with him through '57. And from that November to February, 1958, Mobley would record an unprecedented 8 Blue Note albums of his own in sixteen months. A drug conviction took him off the scene for about a year, after which he played and wrote for Art Blakey's Jazz Messengers. He left the band in September and finally began recording on his own again in 1960. During '60 and '61, he recorded Soul Station, Roll Call, Workout, and the as yet unissued Another Workout, all with Wynton Kelly and Paul Chambers present. Mobley's tone became more intriguing and full voiced. His style reached an extraordinary level of lyricism, distillation and structural sense. These sessions might well be considered his masterpieces. His new approach was perfectly suited to the Miles Davis Quintet, of which he was a member throughout 1961 and 1962. In 1963, Mobley again resumed recordng for Blue Note. And this third phase, introduced by No Room For Squares featured a more agressive and economic Mobley in both sound and choice of notes. It was as if his playing evolved to suit the ensemble sound that he had helped to create. But it was still Mobley, with his sparkling sense of inner logic and inventive left turns. He was merely presenting it in a more direct and forceful manner. Conflicts between his drug habit and the law took him off the scene again in 1964. He emerged in 1965, clean and revitalized and picked up where he had left off. He recorded under his own name for Blue Note regularly until 1970 and worked whenever possible with his own group or in tandem with Lee Morgan. Of course, he continued to pop up frequently on other people's Blue Note dates and gigged off and on with Elvin Jones and Kenny Dorham. At the time of recording Far Away Lands, the saxophonist hadjust returned from two months of touring in Europe. In 1968, he would go back at the urging of Slide Hampton and remain there for two years. When Mobley returned from Europe in 1970, he used Cedar Walton on his last Blue Note LP Thinking Of Home. Before long, they assembled a quintet in which they shared leadership. That band lasted into '72 and worked with some consistency on the East Coast, making one album for Cobblestone (now Muse). Far Away Lands, Blue Note. He moved to Europe from 1968-70, starting out at the Chat Qui Peche in Paris with Slide Hampton, and turning up very much off-form on his friend Archie Shepp's session Poem For Malcolm . By 1975 he had moved to Philadelphia, and reports of ill health filtered into the jazz magazines. By the end of the decade, Mobley was an invalid, unable to play his saxophone. "The doctor told me not to play it, or I might blow one of my lungs out. It's hard for me to think of what could be and what should have been. I lived with Charlie Parker, Bud Powell and Thelonious Monk; I walked with them up and down the street. I did not know what it meant when I listened to them cry--until it happened to me."